The black leather jacket is the ultimate perfect wardrobe staple for transeasonal dressing. You can wear it with summer dresses, woolly jumpers, skin tight jeans or even maxi skirts. I don't have one but right now but I really wish I did as it is the ideal jacket for September. I'm still holding dearly onto the idea of wearing my summer dresses but its getting too chilly as we're heading rapidly towards autumn. A leather jacket would allow for me to still wear my floaty short dresses whilst keeping me warm. However there is one thing about the leather jacket I just don't like... the fact it is made from animal skin. Pleather is getting more and more realistic nowadays so I'd certainly consider getting one of those over a real leather jacket - its a lot cheaper too! 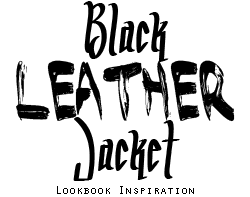 Below is a selection of some Lookbookers offering a lot of inspiration in how to rock the black leather jacket. Great post! I loove leather jacks! Leather jackets are amazing!! and definitely a staple! I want to have this jacket! totally agree, it's so versatile!! great post! such a versatile timeless piece!